In season 2013/14 United again teamed up with Just Sports Group (Ltd) in conjunction with Nike in what is the fifth kit launch in this partnership. 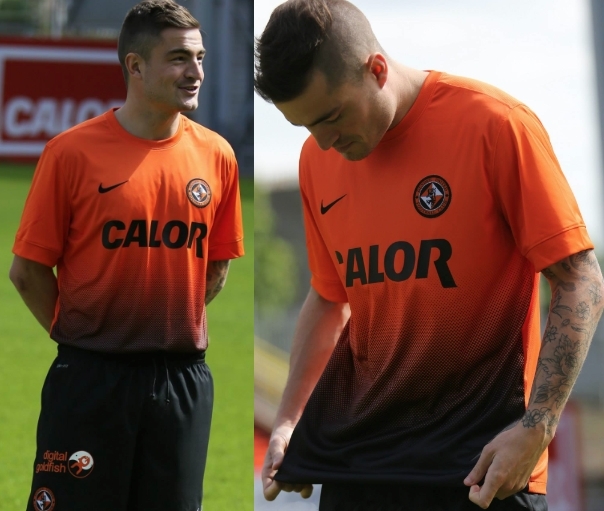 The home design was modelled by new signing Paul Paton at the unveiling. The kit took inspiration from the previous seasons Barcelona orange and yellow away shirt. 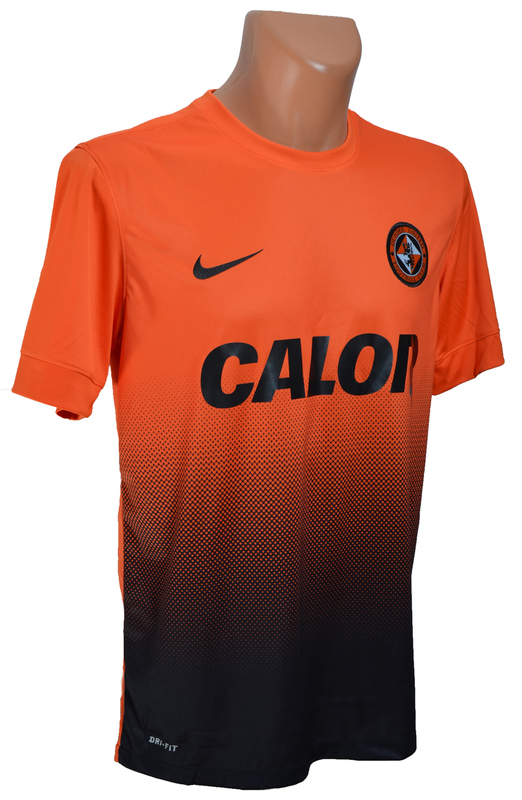 The shirt had a tangerine body with a gradient fading into a full black front panel at the bottom end of the design. The gradient was only present on the front. The back remained completely tangerine. The shorts and socks were both black to complement the full gradient effect. United continued this season with sponsors Calor Gas and again carried their black logo on the front of the shirt. This year however, the sponsor design changed. The white text on the black rectangular background was dropped and instead it was replaced by eye catching large black font. Also in Club colours, the back of the shirt sported the logo of sponsors GA Engineering who were in the second year of a sponsorship deal with the Club. The shorts underscored a further new sponsorship agreement with Digital Goldfish who equally adapted their logo to tie in with the overall look of the new kit. The socks on the kits were sponsored by Tele Taxis who also agreed to modify the colour of their logo to tie in with the overall strip design. The home kit included black numbering and player names, all with white trim. The kit made its debut in the pre-seaosn friendly at Wigan, and then competitively against Inverness Caledonian Thistle at Tannadice two weeks later. It's final appearance was against Celtic in the last League game of the season, before being replaced with a new kit for the 2014 Scottish Cup Final.